Nowadays it is necessary to simulate mechatronic systems as complete systems and not only subsystems (e.g. mechanics, actuators and sensors in one simulation). Since 1998 Dr. Johannes Gerstmayr and his colleagues are working on developing of HOTINT with the focus on simulation of multibody systems. Since 2008 HOTINT is used and further developed in LCM. 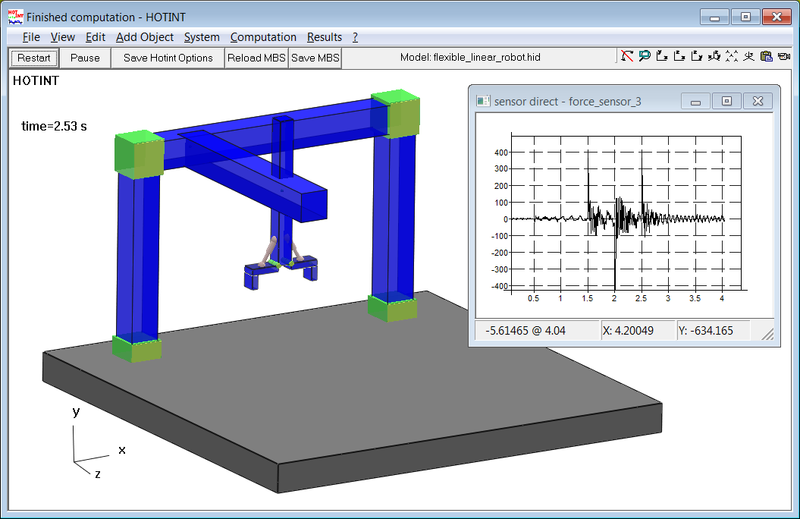 HOTINT is a software for the simulation of mechatronic systems with the focus on the correct representation of complex and nonlinear mechanical subsystems. At LCM special mechanical components have been developed, or developed further, e.g. for the simulation of a pile of metal sheets or fluid-structure-interaction. HOTINT is used in LCM K2 Area internal for research, as well as directly applied from the partner companies. The results and theoretical concepts from the research have been published already in more than 100 publications, many of them in the framework of LCM. In the past year, new features have been added to HOTINT, e.g. the coupling of HOTINT with other software-tools (simulation of fluids, meshing of components, control,…), and a part of the software has been released as freeware. This freeware is available at www.hotint.org and offers the functionality to simulate mechanical systems with control. The mechatronic systems can be set up and parameterized in an easy-to-read script-language. A gantry robot is an example of such a system. The robot is modelled with flexible beams and bearings and therefore the oscillations of the beams can be analysed. In the full version of HOTINT in c++, which is used in ACCM projects, a lot more features are available. All of these features can be adapted individually for problem specific tasks.